Original I Love Bonaire ® flip flops - Slippers. 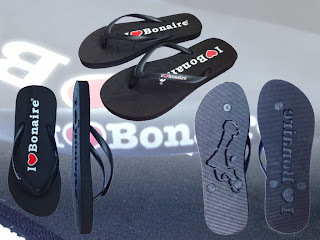 -Follow my steps "on the Beach"
Under the right foot sole you will press the Island outlines and under the left foot sole you will press I Love Bonaire Design on the Beach or wherever you go. -Walk like never Before "in Style with your lovely Island Bonaire"
Slippers are made from durable lightweight foam for easy transportation by Air and for a great gift back home. Unisex style for our great fans. We at I Love Bonaire have dedicated our effort to design a high quality product for your comfort and looks. Available at our webstore and local agent.